This is the history of a group of soldiers who served together in the Vietnam War during the period July 1967 - July 1968. They were members of an elite airmobile infantry company of 160 soldiers, officially known as Bravo Company, 2nd Battalion, 8th Cavalry Regiment, 1st Cavalry Division (Airmobile). A tour of combat duty was exactly one year, and these Bravo Company troopers served during the peak of the Vietnam War and fought in some of the bloodiest battles of the war that included the Battle of Dak To (Nov 67), the Battle of Tam Quan (Dec 67), the TET Offensive (Jan-May 68), the A Shau Valley Incursion (Apr-May 68), and the operations in the vicinity of the infamous LZ Carol/FSB Ripcord (Jul-Aug 68). This site is dedicated to the troopers who served in Bravo Company during this period and to honor all the members of Bravo Company who died in the Vietnam War. We also wish to extend a warm welcome to the many relatives and friends who have a special connection to Bravo Company. As some of our visitors are probably not familiar with military matters, we have made a special effort to present this material without too much military jargon and with sufficient background to make it easy to understand. In the development of this project, we are greatly indebted to the Internet which not only facilitated our research on the Vietnam War, but it also provided the means to re-establish contact with many who served in Bravo Company during the period July 1967 - July 1968. As a result of these Internet contacts, these former members of Bravo Company have provided us with numerous photographs that are used extensively throughout this site, first hand accounts of their experiences in Vietnam, various military documents, and other valuable information from their wartime notes and letters. Our objective for this website is to highlight the military experiences of these Bravo Company soldiers from the time they reported for active duty until they were discharged at the end of their service obligation. Click on the underlined links to explore. Recruit. We start with a summary of the training that each infantry soldier completed before deploying to Vietnam. Arrival in Vietnam. On arrival at the 1st Cavalry Division base camp, all soldiers attended a mandatory course on combat air assault tactics, rappelling, guerrilla warfare, and other subjects. When a soldier finally reached Bravo Company, they received intensive “on-the-job training” under the close supervision of the old timers of their squad. 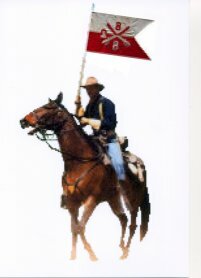 1st Cav Div. Here we provide a short description on the organization of the 1st Cavalry Division and of Bravo Company. The 1st Cavalry Division was regarded as one of the Army’s elite units in Vietnam and known for its esprit de corps. It was also unique because it was the first airmobile division in the U.S. Army with over 450 helicopters. Combat Trooper. The focus here is on highlighting some of the differences between combat and support soldiers, and the eligibility requirements for the Combat Infantry Badge and the Air Medal. Bonds Between Soldiers. Here we provide some thoughts on how and why these young men became soldiers in the U.S. Army, and what was the basis for the very special relationships that developed between these combat soldiers in Bravo Company. The Enemy. We briefly examine the professional army units whose soldiers were recruited and trained in North Vietnam, and the guerrilla soldiers who were recruited and trained in South Vietnam. Although there was a significant difference between the professional and guerrilla units, they both used similar tactics with a strong preference for hit and run. For the most part, they were invisible and attacked us at a time and place of their choosing. Airmobile Operations. Bravo Company conducted numerous combat air assaults and we had a high-level of proficiency in all aspects of airmobile operations. With the help of many photographs, we identify the helicopters that we used and how we conducted airmobile assaults. 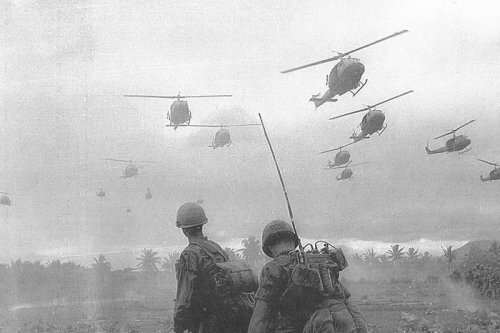 In short, helicopters were used to rapidly move combat units, like Bravo Company, to distant locations where they conducted offensive operations or reinforced other units. Many of the traditional tactics, such as controlling key terrain, lost much of its importance for 1st Cavalry Division units because our airmobile capabilities provided us with the means to hop, skip and jump over a large geographical area at short notice and swiftly. Combat Operations. Here we go into detail on why the Vietnam War was very different from any modern war fought by the US Army. This was an unconventional war with no front lines and the enemy tactics were very different from those used in the Korean War and World War II. Our enemy was often invisible, used guerrilla tactics and attacked us when they had a significant advantage. With the exception of large-scale battles, the norm in the 1st Cavalry Division was that company sized infantry units operated independently in a large geographical area and rarely operated together with other units of the battalion. The normal mission assigned to Bravo Company was to locate enemy forces and to attack them by fire and maneuver. As the perennial searchers looking for our invisible foe, we were at a significant disadvantage and extremely vulnerable. Once an enemy force was located, the company attacked using all available means. If the enemy force was larger than a platoon, the standard practice was to reinforce the company in contact. Point man. Here we describe the most dangerous task during the Vietnam War, commonly known as walking point. In heavy jungle terrain, most of our movement was on narrow jungle trails that our enemy cunningly exploited for ambushing us and to maim us with various types of booby-traps. The pointman was the lead person of his unit and he was responsible for the early detection of enemy ambushes, booby traps and reacting to sudden meeting engagements with enemy forces. Although our casualties among those who walked point were extremely high, it was a position that brave troopers volunteered for. A skilled and seasoned pointman had the instincts of a hunter, was able to identify the many warning signals used by the enemy, was an expert at detecting danger, and he could sometimes even smell the presence of enemy soldiers hiding in the nearby jungle foliage. A skillful pointman was a highly respected trooper in Bravo Company and leaders valued his expertise. This is a chronological history of Bravo Company operations from the summer of 1967 to the summer of 1968. With the help of many photographs and maps, we describe our operations during the Summer 1967 and Fall 1967, and provide details on our participation in the Battle of Dak To (Nov67), the Battle of Tam Quan (Dec 67), the Tet Offensive (Jan-May68), the A Shau Valley Incursion (Apr-May68), and the LZ Carol/LZ Ripcord operation (Jul-Aug 68). This section is under constant revision because we update the historical text on receipt of new and relevant information, and we also add new photographs when appropriate. In between this chronological history of operations and battles, we address several other interesting subjects. Memorial Service. Although still in draft form, this section describes the memorial services held for Bravo Company soldiers who were killed in action. US combat troops during the Vietnam War. The high ethical standards of the 1st Cavalry Division is demonstrated by the actions taken by a senior commander on this incident involving a violation of the rules of engagement by Bravo Company. Bong Son Photos. We spent a lot of time on the Bong Son plains and this is a very interesting collection of photographs taken by our troopers. Bravo Company Barbecues. As a morale booster, high on our wishing list was barbecued steaks and a few beers. The only way we could obtain several hundred T-bone steaks was to “scrounge” them, an old army tradition in wartime. Scrounging was not a problem when you had a large supply of captured rifles for trading with U.S. Air Force supply folks who drooled over the possibility of acquiring one of our Mauser trophy rifles. On a fairly regular basis, we “procured” 350 T-bone steaks with all the trimmings, 2000 cans of beer/coke, etc., etc., and all of these provisions for our super deluxe barbecues were delivered to our base camp on the date we required them by a US Air Force C-130 Hercules. A Spiked Ambush. This story is about a well-planned Bravo Company ambush that was foiled by the women in a nearby hamlet who banged on their pots all night long. No guerrillas activated our ambush that night and we had to admit with a bit of a smile that we had been outwitted by these pot beating wives and mothers. And of course we did not take any reprisal action against these villagers for spiking our ambush, but continued our sweep northwards at first light. Short-timer. As a fitting conclusion to our history, we focus on the last days before a trooper left Bravo Company to return to the States. This was the time for imaginative short-timer calendars and bantering reminders that they would soon be heading home in the “freedom bird”. While these bantering remarks were mostly expressions of happiness, they also contained a hidden element of sadness because of the approaching end to some very unique friendships that are forged in combat. Although we physically left Vietnam at the end of our tour of duty, the awesome experiences of combat had a profound and life long effect on all of us who served in Bravo Company from July 1967 to July 1968.
by Bravo Company troopers by clicking here. Our Stories are first hand accounts by Bravo Company troopers on something special from their tour in Vietnam. The Tiger. While securing a firebase on a stormy night, one of our troopers on watch had a startling experience when he found himself face to face with a tiger. The tiger ran off along the perimeter activating many trip flares and caused a great commotion for 20-30 minutes because our troopers thought it was a full-scale enemy attack. Happy Ending. On a combat assault, one of our gung ho troopers jumped out of a Huey a bit too early and at the same time as the flight leader aborted the landing. This trooper was alone on the landing zone and watched in horror while all the helicopters passed by without landing. He was very relieved when the helicopter lift made a swing around and finally landed with his platoon. A Solo Charge. The first time an enemy soldier fires a shot at you is normally a terrifying experience and the most challenging test that every combat trooper has to take on the battlefield. This story is about how one of our troopers describes his first experience with shots fired in anger. Our Dogs. Puppy dogs were “acquired” by some of our troopers and loved by all. This is the story about one of these pups – promoted to the rank of Sarge, had a special raft for crossing rivers, made many airmobile assaults, loved C-rations, spoiled by all, home made dog biscuits were flown in from Missouri, and poor Sarge just about died after a drinking binge and supposedly walked backwards for about a week. A Brave Act. What do you do when an enemy soldier suddenly appears in front of you on a dark night and believes he is speaking to one of his buddies? And he is armed with an AK-47 automatic rifle and your weapon is leaning against a tree behind him. We’lllll our trooper suddenly reached out with both hands and grabbed the AK-47 with such force that the ……for further details, see the story. The Naked Warriors. 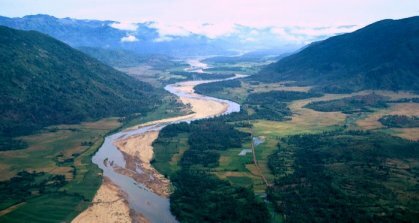 It was one of those very hot days and our mission was to ambush enemy forces crossing the Bong Son River. The river flowed invitingly in front of our positions and some of our troopers could not resist the temptation of a little swim. However, their bathing was rudely interrupted by enemy automatic rifle rounds hitting the palm trees where they had left their weapons and uniforms. This story describes how these "naked warriors" reacted and charged up the river banks firing their weapons to repulse the attackers. Combat Buddies. On joining Bravo Company, a trooper became a member of a team and this involved a very special and treasured relationship, often referred to as the "bonds between soldiers" and "comrade-in-arms". This story helps explain the meaning and obligations of these special relationships. One of our troopers was evacuated to the States with serious wounds and he firmly believed that he had let his buddies down and he also missed them. This combination of "guilt" and "buddies" finally convinced our anonymous trooper that he had to volunteer to return to Vietnam and he eventually made it back to the "First Team". Fire-in-the-Hole. We had great respect for the sharp crack of rifle fire because it usually meant that our enemy was nearby and trying to kill us. Therefore, it was important that everyone was alerted when we test fired our weapons by repeatedly shouting “fire-in-the-hole”. Here is a story about a weapons safety demonstration for newbies and the chaos resulting in the Company area when our battle-seasoned sergeant forgot to shout “fire-in-the-hole” before firing a long burst from his M-16 rifle. The Single Shot M-60. The M-60 machine gun was the most important weapon in Bravo Company and vital to our success in a firefight. This story is about the sudden appearance of four NVA soldiers at our perimeter who we engaged with an M-60 that had a broken spring. So instead of a long burst of deadly steel to suppress these attackers, our M-60 would only fire a “single” shot. Apparently these NVA soldiers were new recruits because they were poor shots and made a hasty retreat when engaged by one of our riflemen. On 8 March 1968, we arranged for a professional photographer to take pictures of each platoon. The negatives of these four platoon photos were placed together to produce a large Bravo Company photograph shown under Our Photos. Each trooper was provided with a copy of this company photo together with an envelope so that he could send it home. Based on recent feedback received from our guys, these Bravo Company photos became treasured possessions. Underneath the company photograph are individual photographs for each platoon. Bravo Company troopers can post their photographs from their Vietnam tour at our Photo Gallery, if they wish. We are very fortunate to have access to an official Company Roster, dated April 1968, with names and other important information on each soldier. We have added additional names to this roster after verification. This website was fully operational on January 30, 2008. The site name, Eager Arms, was the radio call-sign for Bravo Company from 1967-1970. This site is privately funded and our policies are - no membership fees, no dues and no solicitations for contributions. 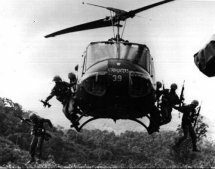 Mission Statement: To record and document the history of Bravo Company from July 1967 to July 1968, to present a collection of photographs taken by members of the unit during this period, to develop a complete roster of troopers who served with the unit during this period, and to provide a means for former buddies and colleagues to contact each other. Membership is open to troopers who served in Bravo Company for any period from July 1967 to July 1968. Members receive a periodic email newsletter containing news and current email addresses of other troopers. Members can post a limited number of their Vietnam photographs on the website Photo Gallery. For those who served in Bravo Company, 2nd Bn 8th Cav during periods other than July 1967 - July 1968, click here Other Year Groups. 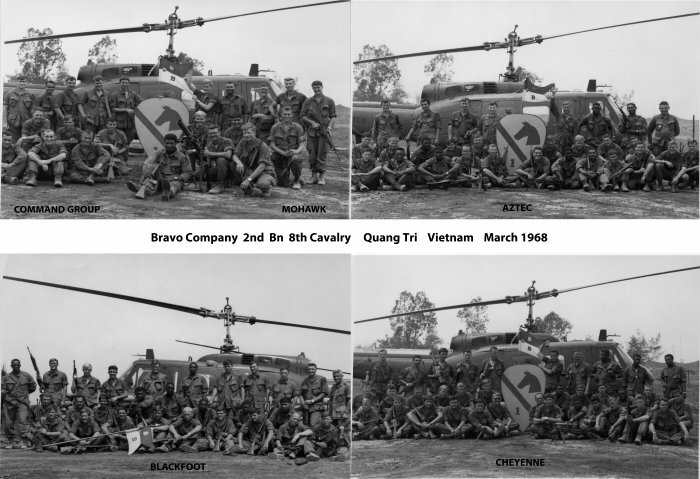 For information on other 2nd Bn, 8th Cav Regt units from the Vietnam War era, click here for links. please send your email by clicking here "Mail to Eagerarms". Martin Brauer for his diligence in producing and maintaining this outstanding website for us. Sven Gerlith for his expertise in preparing some excellent maps and photographs. Colonel Raymond Bluhm (A/2/8 Cav '67) for his professional advise and proofreading the historical text.